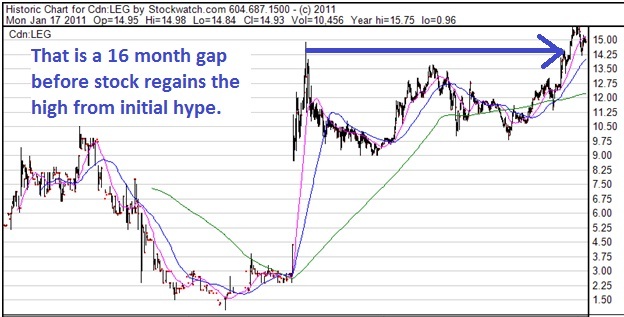 Every year the stock market gives me new lessons to learn, and I’ll share a few from 2010. When it comes to the junior and intermediate North American oil and gas plays, I want to buy expensive stocks. I rarely buy cheap stocks. That sounds counter-intuitive, but it makes sense. When a company trades at a high valuation it can raise money with less dilution, and can use its stock as currency to take over other companies. They can grow more quickly and more efficiently than companies with low valuations. It’s my experience these companies get more growth priced in faster. It’s a circle of prosperity where these companies use their stock or stock price to raise money to buy the better properties. And the brokerage firms that raise them that money (and get all the fees and commissions!) support them by issuing research with higher and higher target prices. New technologies – at this very moment – are revolutionizing the oil and gas exploration industries. But only a handful of people truly understand how the technology works. This remarkable scenario creates an enormous, short-term profit opportunity each time a company employs these new technologies successfully. I’d like to show you exactly how this scenario is unfolding…and how you can pounce on the next triple-digit oil & gas blockbuster. Click here to read my full report that explains how to get started. Of course there are turnaround stories, but they are few. And the ones that meet expectations, in my experience, are even fewer. This last year Bellatrix (BXE-TSX) was one – a heavily gas weighted producer laden with debt that brought in new management, developed their Cardium oil play… and the stock turned around. My experience is that once the analysts and funds have pegged a stock on its valuation, it takes a big success by management to change the street’s mind. I learned how trade “recaps”. A new trend on the Toronto Stock Exchange (in the last 2 years) is the “recap.” This is where a debt-laden junior with few prospects getsrecapitalized with new money directly from the wallets of a new management team (and their friends and underwriters). As such, any debt is reduced or wiped out – and the new team has a big, cheap share position. Often a new suite of properties is vended in at the same time or shortly thereafter. Many, but not all oil-weighted recaps had charts like these. So I learned that if you still own a recap 2-3 weeks after the press release announcing the new team, you will likely have a losing investment for awhile. One exception is Scott Ratushny’s Midway Energy (MEL-TSX) – one of the first juniors to get into the Cardium play in late 2009. It was a great success, as was Brett Herman’s Result Energy, which was taken out by Petrobakken after only being listed for three months. That symbol was RTE-TSXv. With Painted Pony (PPY.A-TSX) I knew that their properties – both the Bakken oil lands and the Montney gas plays – had great addresses. There was no question the oil and gas was there. It was a question of whether or not I could wait long enough with my investment for management to develop its lands – because I was sure tempted to sell the stock in the summer when it was correcting and volume in the stock was low. I was smart with Painted Pony – I did hold on and am now enjoying a tripling of my money. 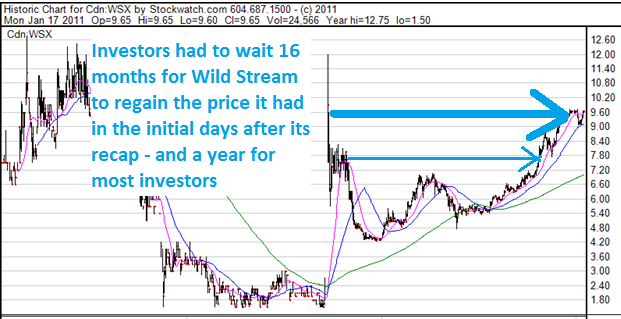 But I was dumb with Wild Stream, (WSX-TSX), another OGIB stock pick this year. Again, I knew Neil Roszell and his team to be very capable, and their four resource plays to be a relative no-brainer. But it was a small position for me, and I succumbed to impatience and sold the stock in the summer. While that was a profitable trade, it has since gone MUCH higher, just as I knew it would. When it comes to exploration stocks – especially the international ones – I want to invest early in plays that have a BIG prize – one that creates what analysts call an “unrisked NAV” that is a multiple of its current stock price. This unrisked Net Asset Value is a bit of a pie-in-the-sky number they come up with by saying – IF this company hits on ALL of their drill holes they will create a resource worth THIS much. It’s a fantasyland valuation. After I bought TAG Oil at $2.35, an analyst came out a couple months later and suggested it could have an unrisked NAV of $225.00 per share – a hundred fold increase. Because international exploration involves more political risk, you want a big prize to outweigh that risk. I know 2010 was a good year when my learning didn’t cost me anything. Despite all my lessons, the OGIB subscriber portfolio – which is my real money – managed to eke out a 74.5% gain for the year.